We drive by this place all the time, but we never knew what it was. I got curious and did some internet research. I found a long list of reported ghost sightings, evil spirits, and otherworldly rumors. It was once the Cannon Memorial Hospital, but it’s been closed for many years. The abandoned structure is heavily vandalized. These days the police keep a close eye on it and will arrest trespassers. It’s the stuff of local legend. It seems everyone has a spooky story to tell, especially college kids. It’s also been featured on several Ghost Hunting Shows. While most of this will be chalked up to rumor and maybe a little legend there is an incident of a patient holding a doctor and some nurses hostage, the hospital supposedly had a history of housing violent patients and the Chief of Police thinks the place is demonic. I found plenty of videos on Youtube of various ghost hunters, but there is nothing definitively proving that spirits dwell in the old hospital. Still, it is kind of creepy. This entry was posted in Uncategorized and tagged Banner Elk, Cannon Hospital, Haunted Hospital on February 13, 2019 by Ed Robinson. This is the last day to get it for $2.99. There is a fugitive loose on McGuire Mountain. Local law enforcement asks Breeze to help track the man down. The mission goes horribly wrong. In the process of trying to make it right, Breeze uncovers corruption by the Chief of Police. Though he’s committed no crime, he once again finds himself on the wrong side of the law. He thinks the problem is resolved, but someone is stalking his cabin. Breeze and Brody become prisoners in their own home. The situation forces Breeze to utilize his mountain skills like never before. This entry was posted in New Books, Uncategorized and tagged Appalachian Mountains, Blue Ridge Mountains, Ed Robinson, Mountain Mystery, Suspense Fiction on January 9, 2019 by Ed Robinson. I was right there on the mountain. Smelling ,hearing,seeing, and feeling the mountain and the woods. Brought back so many memories. And the smells of a mountain man is so true. This is a great start to a new series. I wasn’t ready to say goodbye to Breeze and Brody…I am glad the author has started on a new series. I hope he hurries with his next book. These are great reads. Ed Robinson pulled another great read off as this book will keep you rivited until the end ,I cannot express how happy I am that this book was as good as it is , I was worried that Breeze without a boat wasn’t gonna work but I was wrong . This is one of the best yet . From the Florida Gulf to the Mountains of NC, Breeze still rules. His character gets stronger and more defined with each book. While I hated to see Mr Robinson leave the Florida and Caribbean waters, I thoroughly enjoyed how Breeze adapted to new “terrain” without sacrificing the story. I liked the book. I have read the entire Trawler Trash series by Ed Robinson and was curious about his transition to hill billy living. This book didn’t disappoint. Great story, new location but you helped us make the transition too. Breeze and Brody and their adventures are captivating and never disappoint. Well done, looking forward to the next adventure from our new mountain man and his lady. This entry was posted in New Books, Uncategorized and tagged Appalachian Mountains, Banner Elk, Blue Ridge Mountains, Breeze, Log Cabin Life, NW North Carolina on January 5, 2019 by Ed Robinson. Preorder now and get a discount. Only $2.99 pre-release. It will go live on January 9th. This entry was posted in New Books, Uncategorized and tagged Appalachian Mountains, Blue Ridge Mountains, Mountain Living, Mountain Mystery, Suspense on December 28, 2018 by Ed Robinson. Surviving Snow in the Mountains! Remember folks, we moved here from Florida. 18 inches of snow is a big deal for us thin-blooded flatlanders. Back in December of 2010, I shoveled snow for what I thought was the last time. We were leaving to go live on a boat in never-ending warmth. I swore I’d never shovel snow again. Yup, we shoveled that driveway by hand. We put the car in the garage for the duration of the storm. We lost power briefly on the first morning of the event. I dragged the generator out of the garage, ran an extension cord into the cabin and plugged in necessary items. Out space heater needs electricity, also the refrigerator, coffee pot, and some lights. It all worked fine. We even had cable TV. The power came back on and stayed on thereafter. At least we got a good trial run for future outages. We stayed warm and enjoyed the beauty of winter that we hadn’t seen in a long time. The creek in front of our house. The view from the top of our driveway. We walked up to get this pic. Still haven’t tried to drive out two days later. Those odd-looking lumps are stacks of firewood. The first morning after it started we had 15 inches. Another 3 inches fell overnight. We used to sing “Knee Deep in the Water Somewhere.” Welcome to the mountains, Kim. It’s not even winter yet, but here in western North Carolina, we’ve gotten a good dose. We lived! There are still many days left before spring, but so far we’re enjoying the cabin life. Check back with us when winter is over. This entry was posted in Uncategorized and tagged Appalachian Mountains, Blue Ridge Mountains, Log Cabin Life, North Carolina, Winter in the Mountains on December 11, 2018 by Ed Robinson. Have you ever completely upended your life to try something completely different? We call that a Leap of Faith, and we’ve done it twice. This past summer we moved from a boat in Florida to a cabin in the Blue Ridge Mountains. Talk about a life change, but it has all worked out. It’s hard to express how thankful we are for all of the blessings we’ve received. We have a sweet new home complete with peace and serenity. We bought a new car, new clothes (didn’t have winter wear), even a new fridge. We sold the boat and put some money in the bank. We’ve got great kids, all grown up and doing well. My grandkids will be coming to visit very soon. 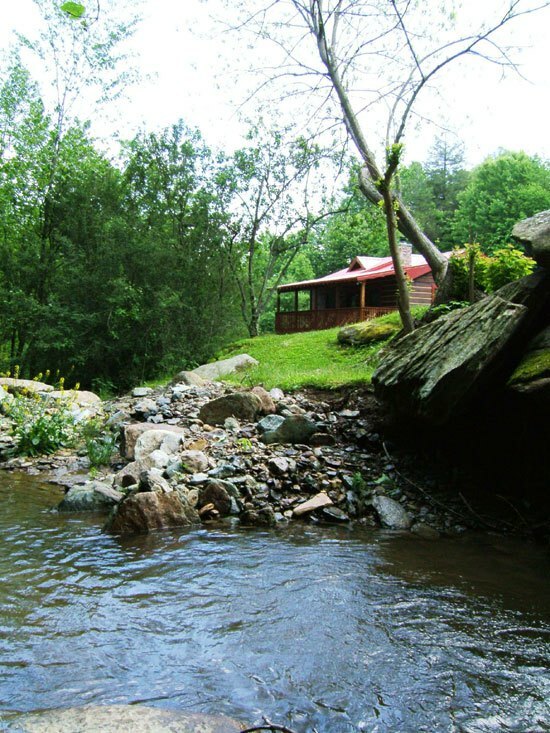 We sit on the porch and watch the creek babble by, amazed by our new life and good fortune. Truly this is a time to give thanks. I also want to thank you – folks who follow this blog, our Facebook community, and those who purchase my books. Without your support, none of this would be possible. I once had a dream to be a writer. Now I’m living that dream. Kim has the home she always wanted. We are thankful every day, but today, on this Thanksgiving, we express our gratitude to each and every one of you who has helped us along the way. It is our sincere wish that you find thanks for your own blessings on this day. Happy Thanksgiving to all. This entry was posted in Uncategorized and tagged Appalachian Mountains, Blue Ridge Mountains, Leap Of Faith, Log Cabin Life, Thanksgiving on November 22, 2018 by Ed Robinson. Breeze escapes his demons in Florida by moving to the Blue Ridge Mountains of North Carolina. He and Brody are settling into their new life when he stumbles onto a plot of marijuana plants on public land. Knowing a thing or two about growing weed, Breeze befriends the mysterious mountain man tending to the crop. When his new friend is killed, he tries to help law enforcement solve the crime. When the authorities prove reluctant, he is forced to take matters into his own hands. In the process, he transforms from boat bum to a true man of the mountains. This entry was posted in New Books, Uncategorized and tagged Appalachian Mountains, Banner Elk, Blue Ridge Mountains, Log Cabin Life, Mountain Living on October 23, 2018 by Ed Robinson.